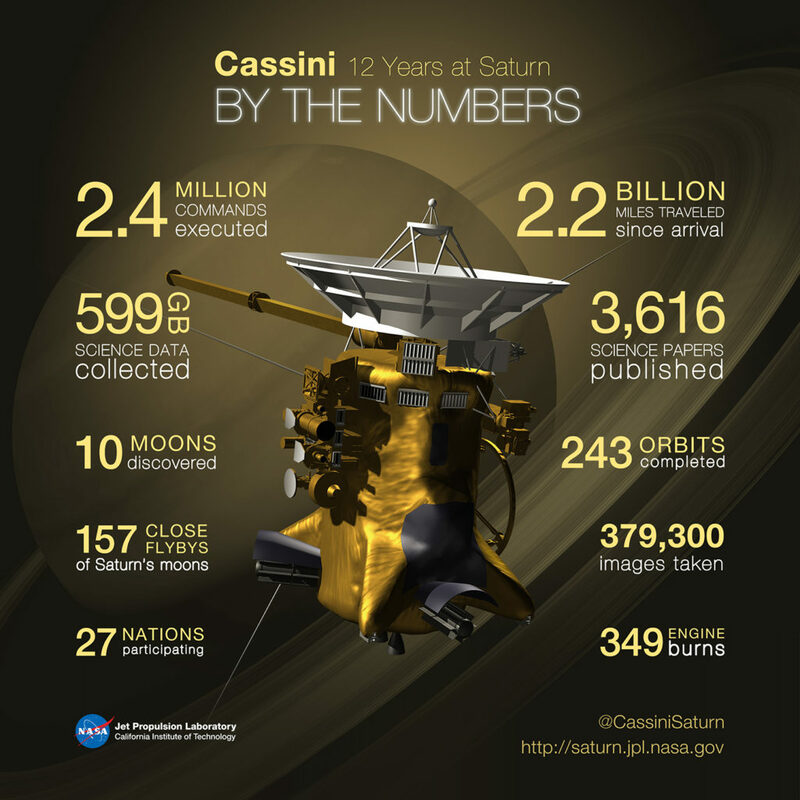 September 15, 2016 – After more than 12 years studying Saturn, its rings and moons, NASA’s Cassini spacecraft has entered the final year of its epic voyage. The conclusion of the historic scientific odyssey is planned for September 2017, but not before the spacecraft completes a daring two-part endgame. Beginning on November 30, Cassini’s orbit will send the spacecraft just past the outer edge of the main rings. These orbits, a series of 20, are called the F-ring orbits. During these weekly orbits, Cassini will approach to within 4,850 miles (7,800 kilometers) of the center of the narrow F ring, with its peculiar kinked and braided structure. Cassini’s final phase — called the Grand Finale — begins in earnest in April 2017. A close flyby of Saturn’s giant moon Titan will reshape the spacecraft’s orbit so that it passes through the gap between Saturn and the rings – an unexplored space only about 1,500 miles (2,400 kilometers) wide. The spacecraft is expected to make 22 plunges through this gap, beginning with its first dive on April 27. During the Grand Finale, Cassini will make the closest-ever observations of Saturn, mapping the planet’s magnetic and gravity fields with exquisite precision and returning ultra-close views of the atmosphere. 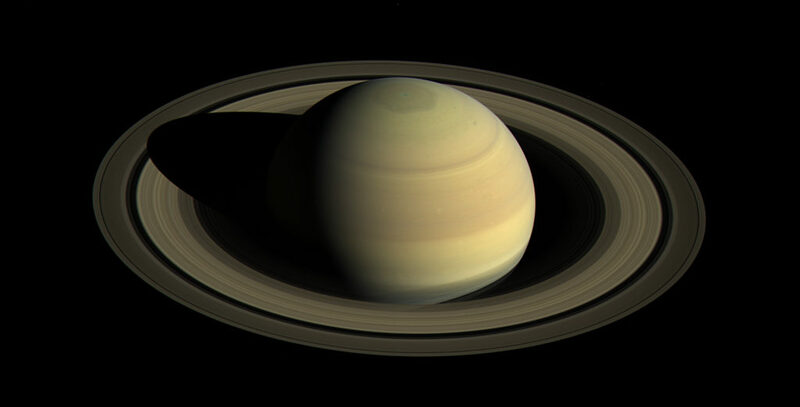 Scientists also hope to gain new insights into Saturn’s interior structure, the precise length of a Saturn day, and the total mass of the rings — which may finally help settle the question of their age. The spacecraft will also directly analyze dust-sized particles in the main rings and sample the outer reaches of Saturn’s atmosphere — both first-time measurements for the mission. Since the beginning of 2016, mission engineers have been tweaking Cassini’s orbital path around Saturn to position the spacecraft for the mission’s final phase. They have sent the spacecraft on a series of flybys past Titan that are progressively raising the tilt of Cassini’s orbit with respect to Saturn’s equator and rings. This particular orientation enables the spacecraft to leap over the rings with a single (and final) Titan flyby in April, to begin the Grand Finale. The Grand Finale will come to a dramatic end on September 15, 2017, as Cassini dives into Saturn’s atmosphere, returning data about the planet’s chemical composition until its signal is lost. Friction with the atmosphere will cause the spacecraft to burn up like a meteor soon afterward. To celebrate the beginning of the final year and the adventure ahead, the Cassini team is releasing a new movie of the rotating planet, along with a color mosaic, both taken from high above Saturn’s northern hemisphere. The movie covers 44 hours, or just over four Saturn rotations. “This is the sort of view Cassini will have as the spacecraft repeatedly climbs high above Saturn’s northern latitudes before plunging past the outer — and later the inner — edges of the rings,” said Spilker. And so, although the mission’s end is approaching — with a “Cassini Final Plunge” clock already counting down in JPL mission control — an extremely important phase of the mission is still to come. The Cassini-Huygens mission is a cooperative project of NASA, ESA (European Space Agency) and the Italian Space Agency. NASA’s Jet Propulsion Laboratory, a division of Caltech in Pasadena, manages the mission for NASA’s Science Mission Directorate, Washington. JPL designed, developed and assembled the Cassini orbiter. The imaging operations center is based at the Space Science Institute in Boulder, Colorado.